No..wait! It’s not what you think! A while back, fellow Mermaid author Carlene Love Flores dropped me a line to tell me about a really cool project her neice was doing in school. Unfortunately, the Enchanted square was not selected for the quilt…but that doesn’t make it ANY LESS AWESOME. In this era of cover reveals and cloverflipping, I am honored to have such amazing fan art in my corner! 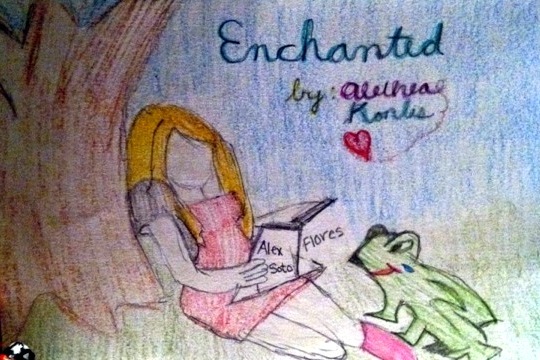 So, to celebrate this week’s release of Enchanted in paperback, I present to you: Alex’s fabulous new Enchanted cover! Please gush in the comments accordingly. Thanks!!! I totally LOVE this frog. And the heart! Just like when I sign my books! So awesome. This entry was written by Princess Alethea and posted on May 29, 2013 at 8:00 am and filed under Art, Enchanted. Bookmark the permalink. Follow any comments here with the RSS feed for this post. I love the way the heart is trailing from your name. Sooooo romantic. Great frog! Wow…I wish I could draw like that. I’m trying to figure out… is that a tear in the frogs’ eye or a water droplet from his pond/bucket he swims in? Perhaps he has tears in his eyes because he knows he could never be the kind of friend to Sunday that he’d like to be. LOVELY PICTURE ALEX! Bravo! Creativity & talent springs eternal! So glad to see it represented so beautifully in the next generation. Kudos to Alexandria, Carlene, and Alethea for being so generous sharing the waters in the talent pond. Beautiful! 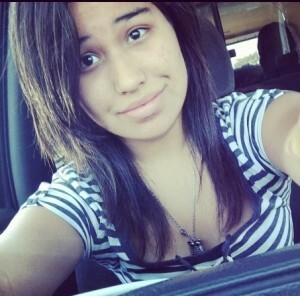 Alethea thank you for encouraging my daughter to express herself thru art. I’m sure this opportunity will motivate many children. Thank you , I am so honored to have my picture up on your website . You’re book was fantastic and I’ve recommend your book to many of my friends as well. You guys are AWESOME. I don’t even know what else to say! I love the frog and the composition the best!